When pregnant or breast-feeding, some mums may experience fluid retention, or Oedema. This can cause pain and swelling around the ankles or wrists. Some may even be diagnosed with Carpal Tunnel Syndrome. Postnatally, some mums may continue to experience wrist pain on a level similar to arthritis or Repetitive Strain Injury (RSI). All this AND sleep deprivation? You gotta be kidding! Recently in Mum & Baby Yoga one of our Mums demonstrated a wrist exercise she learnt from a vineyard owner, for relieving RSI in their grape-pickers’ wrists. I’ll attempt to repeat it here. Reply with a comment if you need a photo! If you have ongoing wrist pain, see your GP for a proper diagnosis. For RSI or Carpal Tunnel Syndrome, it may be necessary to wear a wrist splint. This keeps your wrists straight, i.e. in line with your arms, so that you flex and move your fingers to perform repetitive actions such as typing, pushing a pram etc, instead of continually flexing at the wrists. Thankfully there are many wrist stretches you can do, and safe alignment guides in yoga, to significantly improve your grip. See my top 5 below. Enjoy and most importantly, let me know how you get on! In Pilates, and Yoga postures, every time your hands are on the mat, make sure your thumbs and index fingers are superglued to the floor, so that you can really feel the inner edge of your wrist is connected with the mat. Check that the pads of your palms are pressing into the mat, hollow the middle of your palms up away from the floor. Spread your fingers out wide away from each other. Middle fingers face towards the top of the mat. Reach out into your baby fingers, really reach beyond, and feel your baby fingers pressing into the floor. Feel how the outside edge of your wrist is on the mat. Look at your arms and notice are the elbow creases facing each other. Draw your arms back up to your shoulders and slide your shoulder blades down your back. Next time you’re in Table Top or Downward Dog, any arm balance…look at your thumbs and your index fingers, and ask, are they superglued to the floor? Notice how you use your wrists. In the office: When using your computer, notice are your hands extended straight from your lower arms or do you bend at the wrists? Are you sitting tall, aware your core when typing, or are you slumped in your seat, with your head 2 inches forward of your spine? Try drawing your ears back so they are in line over your shoulders and relax your arms down by your sides. Then bend your elbows, hands forward, so that as you type, your palm base & wrists rest on the “WRIST REST”! (foam thingy in front of your keyboard). As you type, keep your elbows tucked in to your waist. Watch how it’s your fingers that flex as you type and your wrists stay straight. It’s amazing how something as simple as switching on your lower tummy muscles affects how you use your shoulders, and arms, all the way down into your wrists. Notice when driving, are you slumped in the seat, sitting back on your tailbone, or hunched over, clenching the wheel with your wrists flexed and knuckles tight? Relax those shoulders and drive from your tummy button, not your wrists! If you cycle to work, notice how you cycle. Got tense fingers gripping the handlebars? Actively lengthen the front of your body, engage your lower tummy and release your shoulders. Feel how your neck lengthens when you draw your arms back towards your shoulder sockets and slide your shoulder blades down your back. Notice can you keep your wrists straight in line with your lower arms, so your fingers hold the handle bars with ease, and you cycle from your core muscles, not your shoulders and wrists. Pushing the pram? Lead with your lower tummy as you walk. With the safety belt on 😉 try pushing the pram with just your index fingers resting lightly on the handlebar. Adjust the height of the handlebar, so that when you hold it your hands are in line with your lower arms, wrists straight. As you walk, keep your tummy and pelvis aligned under your shoulders, so you walk and push the pram from your centre (rather than pushing with your upper body, while your lower body trails behind it, adversely loading tension into your shoulders, sacroiliac, low back, etc… migranes anyone?!). Push off with your feet (like ice-skating) and fully extend as you walk, using those lower body muscle groups to maneuver that double buggy, not your wrists! Remember, strong glutes = toned pelvic floor and happy lower back. But that’s a blog for another day. There are so many clips, it’s easy to find a short 3 minute sequence you can do everyday. Carpal Tunnel Syndrome: I used an empty glass instead of bucket of sand, lightweight! Stand in Tadasana, Mountain Pose. Soften your shoulders down your back, releasing any tension in your neck. Keep the back of your neck long. Draw your armpits down towards your hips, engaging your lower tummy, spine in neutral alignment. Raise your arms forwards to shoulder height. Arms straight, extend your wrists, so that palms face forwards, fingers point up to the ceiling. Push out into the base of your thumbs. Spread your fingers wide apart and draw your baby fingers back towards you. 1. Turn your palms outwards, 90 degrees clockwise. Press into the base of your thumbs. 2. Turn your palms another 90 degrees so that your fingers point to the floor. Progess: Stand with your feet together. Bend your knees, into a skiing position and contract your lower tummy. From here, keeping your arms straight (elbows facing forward), lower them until your fingertips touch your thighs, palms face the floor. Repeat move #4 standing at arms distance in front of a wall. Press the heel of your palms into the wall, keeping your elbows straight as you perform the movements. Come onto your mat on all fours in Table Top. Knees parallel, hip-distance apart, tops of the feet on the mat, heels in line with your knees. Place your palms on the floor, shoulder-width apart, middle finger in line with your shoulders. Check that your hands are a little ahead of your shoulders, fingers facing the top of your mat. Spread the weight evenly into all fingers, and from the inner to the outer edges of your wrists. Only practice this move when swelling has reduced and you are happy to bear weight on the wrists. If there is ANY pain present, repeat moves 1-4 only. Wrist Extension: Turn your hands inwards 90 degrees, fingers face each other.Turn your hands inwards another 90 degrees towards you (try one at a time at first), fingers face your knees. Pretend to sit back onto your heels and press into the base of your thumbs, keep your elbows straight. Move your upper body forward so your shoulders are in front of your wrists. Feel the inner edge of your wrist on the mat. Come back to Table Top and turn your palms forward so fingers face the top of your mat again. Turn your palms outwards 90 degrees, fingers face the sides of your mat. Turn your palms outwards another 90 degrees, fingers face your knees. Sit back towards your heels and feel the stretch down the front of your arms as you extend your wrists. Move forward until your shoulder go beyond your wrists. Come back to Table Top. Only go as far as is comfortable. You want to feel the stretch but no pain. Wrist Flexion: Turn your palms facing up, try it one at a time at first. Backs of your hands are on the mat, fingers face forward towards the top of your mat. From here, turn your palms inwards, 90 degrees anti-clockwise; fingers face each other. Turn them inwards another 90 degrees anti-clockwise, fingers face your knees. Feel the weight equally across from your baby finger to your thumb. Turn them another 90 degrees anti-clockwise, fingers face the edges of your mat. Challenge yourself: Move your upper body forward and back, feeling the weight and the stretch along your wrists as you press evenly into your baby fingers and your thumbs. So there’s my top 5. Turned into a wrist health nerd and need more? See my next blog post on the phenomenal Katy Bowman’s guide to wrist health. Need some energy after all that wrist action?! Almonds and chocolate, my two favourite foods in the world, ever! 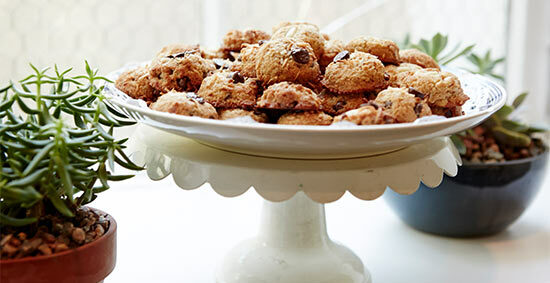 Thanks to Goop for this amazing cookie recipe. I used 1/3rd of the amounts listed, and played around with the ingredients. Here’s the original recipe, followed by the one I made up. REFRIGERATE batter until chilled (optional). Add more coconut and chocolate chips to the top (push down slightly), and bake at 325°F for 8 minutes. Send some, along with kids and husband for 48 hours, to Grandparents who heartily approve!